Biologists and volunteers in the Yakima Basin move nuisance beavers into upper Yakima River tributaries. Photo courtesy of William Meyer. With their strong buck teeth and flat tails, beavers are the engineers of the natural world. Their craftsmanship, however, sometimes impacts man-made environments such as houses, roads, and farms. As a result, beavers are often considered to be nuisance animals and killed for the trouble they cause. Now, beavers throughout central and eastern Washington State are being saved. 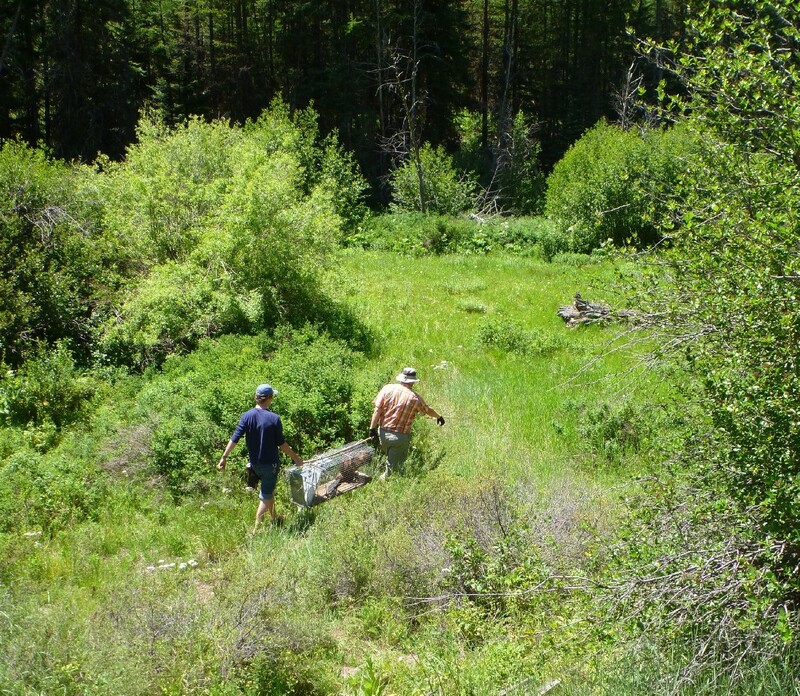 In March 2011, the Washington Department of Fish and Wildlife (WDFW) established a three-year pilot project to relocate troublemaking beavers from homes and farms and move them to upper river tributaries. WDFW biologist William Meyer has been working on the Yakima Basin Beaver Project since its inception. This beaver is becoming acclimated to the creek before release. Photo courtesy of William Meyer. “I originally got the idea for this project from the Methow Valley Beaver Project,” said Meyer. “I thought, ‘I need to apply for a grant and do this project in the Yakima Basin.’” Meyer received funding for the project from the Salmon Recovery Funding Board. Eastern Washington is a dry and arid place concerned with water storage and maintaining a healthy water cycle for crops, wildlife, and people. As climate change progresses, concerns about water quantity and quality continue to mount. 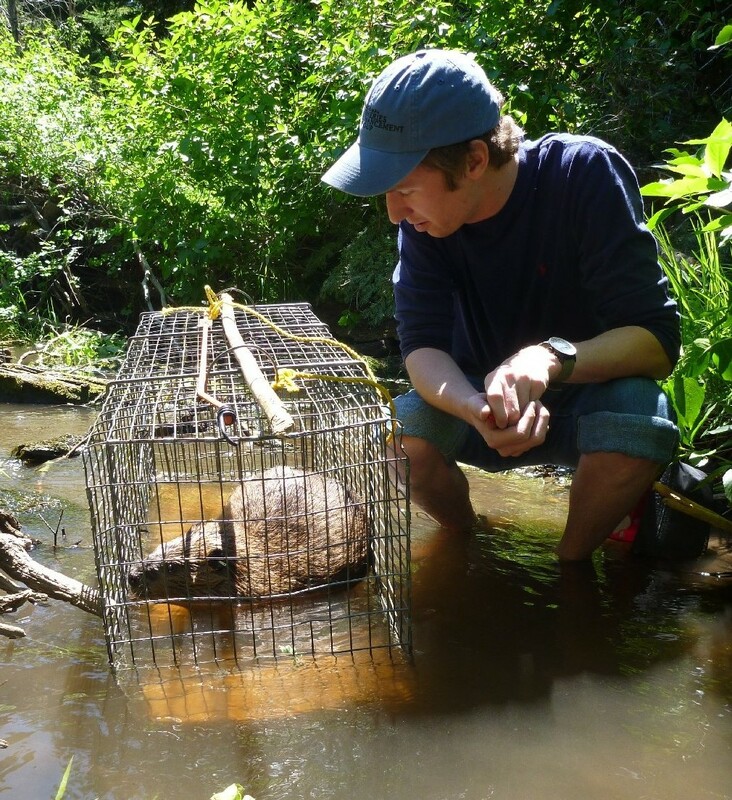 Through the relocation of 105 beavers over three years Meyer has seen firsthand how these fuzzy engineers help restore stream ecosystems. The WDFW has also captured images of the relocated beavers building dams and grooming themselves in their new habitat. Over the course of a year one beaver colony provides about $13,000 of ecosystem services. These services range from connecting flood plains to benefit plant growth, preventing floods by enabling water to slowly soak into the soil, and preventing pollutants from flowing downstream into drinking water. The most notable benefit is restoring salmon habitat. 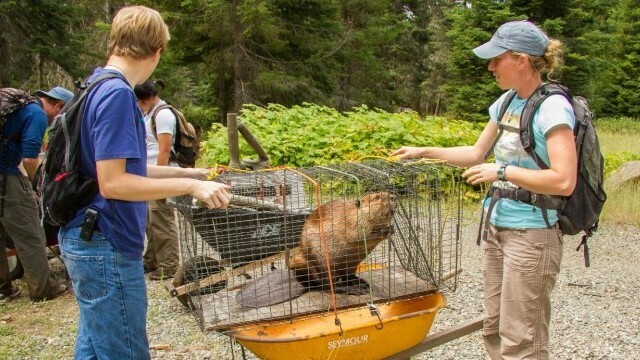 “The success of Coho salmon is highly connected to healthy beaver populations,” said Meyer. Beavers are the largest rodent in North America, and moving them can be a challenge, but biologists think the benefits outweigh the costs. Photo courtesy of William Meyer. By the 1980s, certain Yakima Basin salmon runs had disappeared and others were nearly extinct. After 20 years of reintroduction efforts and habitat improvement projects, including beaver relocations, the area is seeing the salmon return. One result of the beaver ponds is that stream flows improve, which means better migration paths for the salmon. The ponds also provide safe spots for young salmon to rear, prior to migrating to the ocean. Beaver populations around the world have survived habitat loss, fashion trends, and slaughter by agitated residents. Thanks to the Yakima Basin Beaver Project and other groups in Washington, nuisance beavers are becoming worker beavers, and their populations may be reviving once again. Yakima does good work for a good reason. But too often beavers are viewed as a ‘nuisance’ and easily removed rather than educating the affected parties about their value and management. (Not to mention that new beavers will just move in to adequate habitat later). Relocation is a short term solution for the affected party. Flow devices can regulate pond height effectively and even in the city streams beavers can make a huge difference. I should know, my own city installed a flow device to control flooding 6 years ago, allowing the beavers to remain. Now because of our safe, beaver tended wetlands we regularly see otter, steelhead, woodduck and even mink in our urban stream. How can a person comprehend the above story(s) and make such an ignorant and itiotic comment as this from “truth hertz” is beyond me. But I can understand that the name indicates something about some peoples’ idea of what TRUTH is. Perhaps an extremely closed mind!!? We welcome lively discussion and debates but we do need to keep it within our guidelines. Future violations will result in you being barred from posting further comments. Thanks for your understanding. I apologize I guess, however the statement “The only good beaver is a dead beaver” from “Truth Hertz” seems at least equally offensive and inappropriate in context with this story and could easily be construed as a personal attack on beaver!! Perhaps it does have some value in illustrating some of the attitudes that have brought this Country to such environmental degradation that species are being lost or subject to disease infestation and water, air and climate are continuing to decline in quality and stability! Thanks, Rick. We try to stay out of moderating discussions as much as possible. We are happy to have you and “Truth Hertz” discuss some very different viewpoints of a complex issue. There were no beavers in central Indiana 30 years ago an things were fine… NOW I have five or six 80 year old oak trees IN my pond and countless others simply eaten alive. It’s interesting (sort of) that you think Indiana with no beavers (a totally un-natural situation) was “fine”. I guess you are just too pissed off to see the other benefits that results (as stated above and in the main article) from beaver activity. Even in your rising pond there must be increasing wildlife as is usual, and of course dead trees are critical nesting and other wildlife habitat. Also openings in forest edges provide critical regeneration space for other needed vegetation, important for browsing, cover and nesting for multiple species of wildlife…though can look messy for awhile sometimes, nature does fill this habitat in vital ways…ask any Biologist worthy of that title! !..just try to open your eyes and your mind to the actual truth and perhaps see the bright side!? Riddle me this beaver person? How do you keep a beaver from burrowing UNDER eighty year old oak trees on the edge of the water or digging a lodge in an earthen dam? Answer: Shoot them on sight or trap them as often as possible. Water level in not the only problem. How can a person comprehend the above comment and make such a claim? Central Indiana woodlands have no problem with water but it DOES have a beaver problem. Around here they are nothing more than giant rats that kill trees. I’m sorry whatever happened to your pond, considered by you to be damage from beaver, has made you so anti-beaver that you can’t see beyond this personal situation to the overall critical beneficial role beaver fulfill on God’s green Earth and for our healthy ecology in general! The TRUTH is that beaver are important in so many ways beyond wheather you believe Indiana has a water problem or not and is partly illustrated and explained by the above story. They are also important for water QUALITY and CATATROPHIC FLOOD control, DROUGHT resistance, fire suppression, biodiversity, ecological resilience and create habitat for myriad necessary plants and animals as only they can in their God created evolutionary place which should be throughout N. America including Indiana. If you care about the health and abundance of our natural plants, animals, fisheries, streams and, yes, even forests beaver habitat must be present and protected! Try telling that to a capybara! You are so right! They are the largest rodent in North America. The photo caption now reflects that change. Great story about the tremendously underrated and largely unknown or misunderstood benefits of Nature’s ecosystem engineers!!! You must read: “Three Against The Wilderness” by Eric Vesey. It takes place in the 1940’s and 50’s in the Riskey Creek area of central British Columbia just west of Williams Lake, BC, Eric married a young woman of native decent and they moved into the wilderness and had a child, built a cabin, lived off the land and brought the beavers back to the meadows in that area and saved a whole lot of water that could later be used for stock, cattle and irrigation. It is a wonderful TRUE story. After you read it you need to take a trip to BC. Go north on Hwy. 93 after seeing a bit of Montana and then go to Fort Steele, up to Banff, Jasper and then take HWY 16 from Jasper to Prince George, turn south and go to Barkerville, an old gold town that is now a living museum like Fort Steele, then south to Williams Lake and head West and go all the way to Bella Coola on that fearsome road that makes the Going To the Sun Highway in Montana a sunday stroll. Then take the ferry either up to Prince Rupert and on to Alaska or head south on the ferry to Port Hardy and then to Port McNeill, go over to San Josef Bay at the start of the Cape Scott hike, then to Malcolm Island, and Sointula, a Finnish settlement. Then to Gold River and a boat ride on the SS Uchuck = we call it the up chuck in bad weather out to Friendly Cove for a nap on the stoney beaches, then a drive down Vancouver Island to Salmon Point Inn for a walk in the woods, the beach and along the oyster river. Then it is the Comox Valley, Nanaimo, Duncan, Victoria and back to Washington State.